Modifies the look and feel of the battery menu item. Is there a better alternative to BatteryWorks? Is BatteryWorks really the best app in System category? Will BatteryWorks work good on macOS 10.13.4? 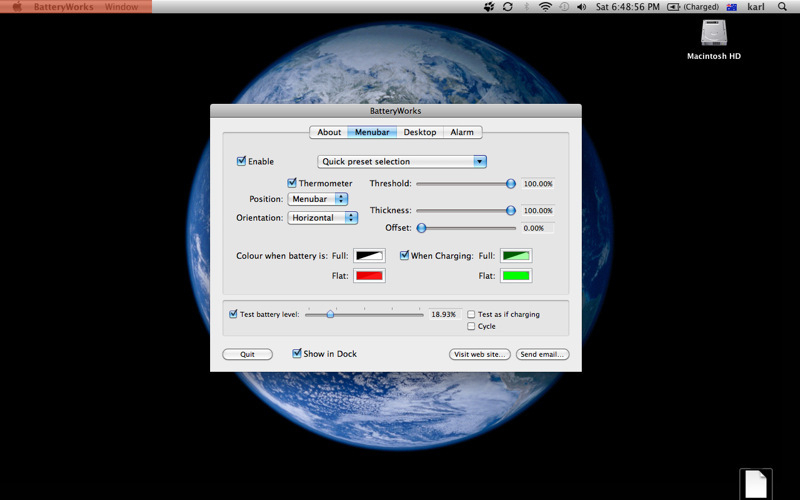 BatteryWorks displays the level of your computer's battery. It does this by displaying a graph/thermometer or colouring an area of your screen a particular colour to show you the battery level. These can be on your menubar or desktop. The size and location of the graph can be selected. The colour (and transparency) of both when the battery is empty and when it is full can be specified. Battery levels between empty and full will blend the two colours and their transparencies. Changed the way the helper app starts. BatteryWorks needs a rating. Be the first to rate this app and get the discussion started!